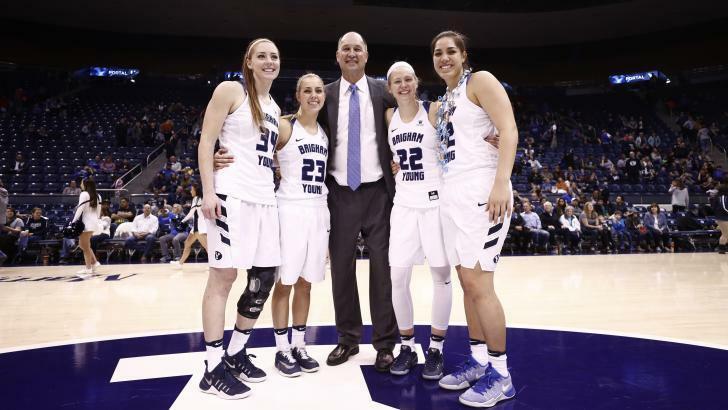 BYU women’s basketball pulled ahead in the fourth quarter of its final home game to defeat Gonzaga 71-63. Head coach Jeff Judkins said this was the team’s best defensive effort he’s seen. Kalani Purcell was the top scorer of the game with 21 points, matching her career high. Cassie Broadhead and Makenzi Pulsipher also scored in the double digits with 19 and 11 points, respectively. Judkins and the other players recognized the important role Purcell played in Saturday’s victory. In the first quarter, both teams fought to find an edge. Gonzaga pulled ahead by seven before Broadhead sunk a trey to end the BYU drought. Throughout the rest of the half BYU turned up their man-to-man defense a few notches and prevented Gonzaga from any runs. The two teams went shot for shot the remainder of the second quarter. The Cougars shot 39.4 percent compared to the Bulldogs’ 48.5 percent in the first half. The teams went into the second half with just a three point gap. The second half started slow with a five minute period without scoring until the Bulldogs broke ahead for an eight point run. After a backhanded layup from Nielson, Pulsipher stole the ball in Cougar territory and made her first 3 of the night, bringing the Cougars within one point of the Bulldogs. Purcell lit a fire under the whole team after making a jumper to pull the Cougars ahead for the first time in the second half. The fire led to a 23-1 run in the final minutes that the Bulldogs couldn’t come back from. Pulsispher said the team is looking forward to carrying their great momentum going into the West Coast Conference tournament. The Cougars travel to Las Vegas next week for the tournament as the number two seed. They’ll play Friday at 2 p.m.